Emmanuel (God with us): Why the real presence of Jesus Christ is so important for proper worship. From all eternity, up until the physical conception and subsequent birth of Jesus Christ … in the flesh … man perceived God as a mysterious, awesomely powerful, largely unknowable being, whose divine essence was thought to consist of pure spirit. Christmas fundamentally changed man’s perception of God as well as the reality of his divine person-hood, since we know now that God, as part of his true nature … assumed a distinctive, eternal, human soul, along with a (now) resurrected and glorified human body. A body that is presumably … fully compatible with both heaven and earth. 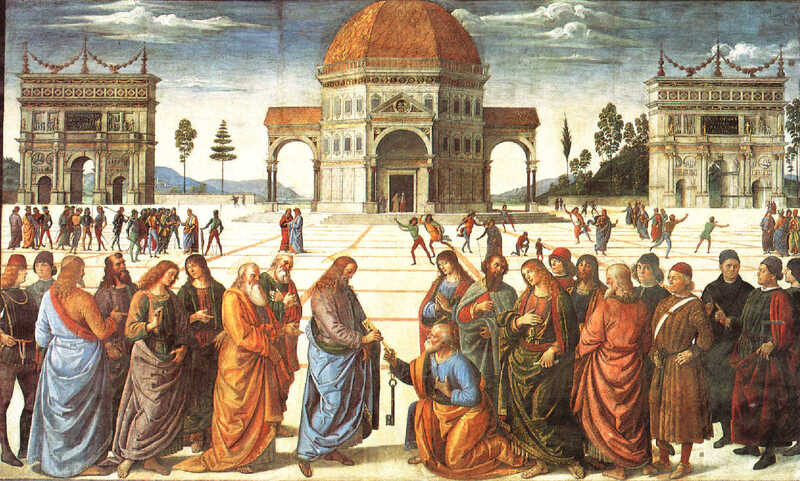 The terms of God’s New Covenant substantially incorporate and memorialize that profound change in many ways, none more important than the definitive liturgical sacrifice of the New Covenant … the Holy Sacrifice of the Mass … where the memorial symbolism of the traditional Hebrew Passover Feast is replaced by the body, blood, soul and divinity of Jesus Christ … the true Lamb of God … who takes away the sins of the world. Jesus did that … just as he subsequently suffered and died for us … in the flesh … and as one of us, in every way … except for sin. It’s very nice to know that God is listening to our prayers, and that he is there for us, whenever we gather in his name, but the difference (to we human faithful) between God being present in a purely spiritual sense and being truly physically present for us … body, blood, soul and divinity … as in the Holy Eucharist … is a difference of such magnitude that it is impossible to put into words. If it wasn’t for the incarnation, where God took on flesh and became one of us, in order to save us from our sins and reconcile heaven and earth, we would all still be hopelessly enslaved to Satan, sin and death. Catholics incorporate all of this and more into the Holy Sacrifice of the Mass, the essential liturgy given to us by Christ himself, at the Last Supper, where we give correct praise and proper worship to the Father, the Son and the Holy Spirit … with, in and through Jesus, who is the perfect mediator and who remains the only acceptable sacrifice for sin … becoming truly present for us on the altar, at every Mass. Presented with a sacrifice such as this, we can be assured that God will always find it pleasing and acceptable, and that he will graciously respond, even in the face of our many iniquities and human failings, since at least one of us humans present there (Jesus) has already attained divine perfection. Without Jesus Christ, truly present, body, blood, soul and divinity … God with us … at the very center of our divine worship … we miserable sinners have very little to offer up to God. 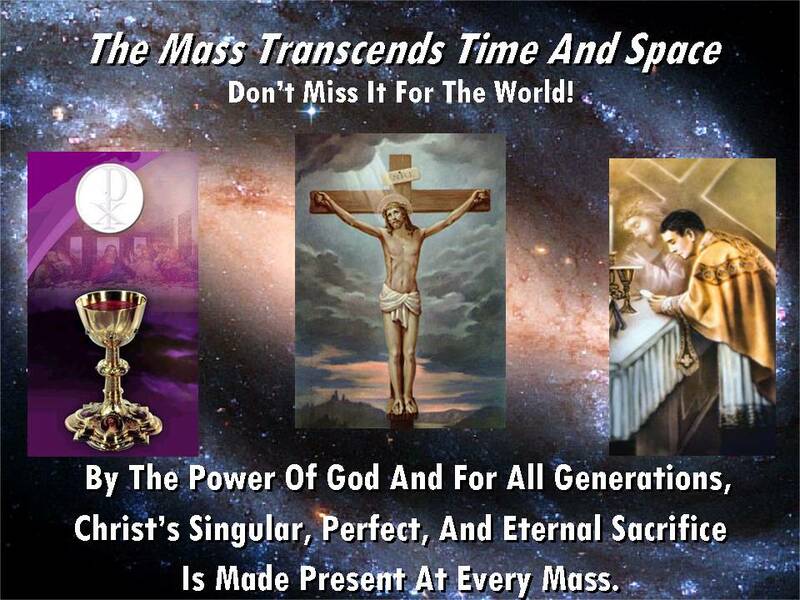 But at Mass … with Christ, in Christ, and through Christ … in the unity of the Holy Spirit … we have the ability to invariably please God, become the recipients of all his graces … and successfully maintain in our hearts the blessed hope of spending an eternity with him, in heaven. Attempting to worship God any other way begs the question: Why would God have gone to all the trouble of becoming man, instituting the Holy Eucharist at the Last Supper, becoming a living sacrifice for the sins of the world, rising again from the dead and personally founding his one holy, Catholic and apostolic Church, if not to have things done the way he set them up? Imitating Christ: How to Make Your Family Holy. The Holy Family of Jesus is the greatest example and model for all human families. 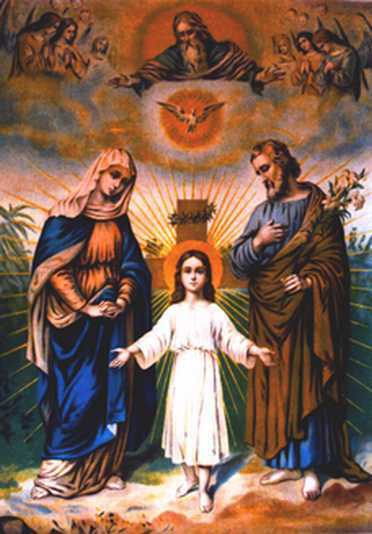 The Holy Family, like our own, knew and experienced hardships and tensions. We hear of one such episode in the Gospel which is the basis for both the third of the Seven Sorrows of Mary and the fifth of the Joyful Mysteries of the Holy Rosary; the loss and finding of the child Jesus at the Temple. As we meditate on this passage of Sacred Scripture (cf. Luke 2:41ff), we can relate to the emotions that Mary and Joseph experienced, the anxiety and joy, in realizing that they did not know where their child was and then finding him safe and well at the Temple. Going deeper, we can each, perhaps, see in our own life the times when we have left Jesus behind… the anxiety when apart and the joy and peace that comes when we have again found Jesus in the center of our family. Abortion is the leading cause of death among black Americans. In January, Margaret Sanger’s disciples and abortion lovers have much to celebrate. It will be the 40th year of legally sanctioned abortions in the United States. At the time I am writing this, the death toll of murdered babies via abortion methods is 55,110,996, and it climbs every few seconds. These murdered babies are predominately black babies. Where are the crusaders for social and racial justice, for the worst racist genocide in human history? The Catholic Church is the longest-enduring institution in the world, and her historical character is integral to her identity. The earliest Christians claimed to be witnesses to the life, death, and Resurrection of Jesus, thereby making Christianity a historical religion, emanating from a Judaism that was itself a historical religion. Christianity staked its claim to truth on certain events, notably that at a precise moment in history the Son of God came to earth. The Gospels have a ring of historical authenticity partly because of the numerous concrete details they contain, the care with which they record the times and places of Jesus’ life. Sometimes we have to wade in, sword or gun in hand, and use deadly force to quash the actions of evil men—and we must do so without hating them. Too soon after Christmas trees are taken down, hundreds of thousands of us will be getting ready to freeze in our nation’s capital while we March for Life. The presence of evil, of very different kinds, is harder to miss this year than most—at least since 2001, when my hometown was attacked. Because it was innocent blood, willingly offered, that wiped away the evil each of carries in himself, and offered us the antidote: imitating Christ, making sacrifices freely to further the Good, and push back against evil. Those sacrifices aren’t always peaceful—which is why the Church has thousands of soldier saints. We are not a religion for pacifists, or those who would stand by dabbing our tears and caressing our consciences while the weak are victimized. Sometimes we have to wade in, sword or gun in hand, and use deadly force to quash the actions of evil men—and we must do so without hating them. That doesn’t mean without anger, or even without (where needed) the will to kill. The plot to assassinate Hitler in 1944 was carried out by a Catholic war hero, Claus von Stauffenberg, and met with the approval of Pius XII—who transmitted messages on behalf of the conspirators. Nor is it hate to want to see a criminal be punished, or to take a grim satisfaction in the execution of his sentence. Only those who do not believe in life after death who could think this way; to them, earthly life is the only and ultimate good, so wanting to spoil that for or take that from someone (for any reason) amounts to hate. What’s at stake is the drift among some U.S. nuns away from the Church’s faith in the central role of Christ and His Body, the Church, in human salvation. 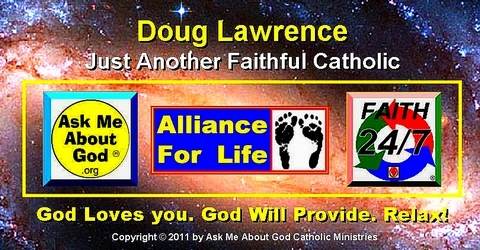 The CDF implies that some in the leadership of the LCWR have embraced forms of inter-religious dialogue based upon the alleged or supposed equality of all religions. AMSTERDAM—Thousands of Dutch Catholics are researching how they can leave the church in protest at its opposition to gay marriage, according to the creator of a website aimed at helping them find the information. QUESTION: Christians, If god didn’t sacrifice himself to himself to bypass a rule he made, then what did he do exactly? Real, holy, just, powerful and perfect feminism. Nothing like what we all too often encounter today. When Does Human Life Begin?